This digital recorder combines fun audio function in a handmade wood housing. This playful gadget puts a digital recording tool in the palm of your hand. Hit the red record button to capture vocals or other sounds, and then manipulate them with loops and pitch-bending playback for beatboxing and all-around audio fun. The handmade wood housing with DJ turntable-inspired graphics makes this a user-friendly package that will invite endless sonic experimentation for teens and adults alike. Handmade by Richard Upchurch in Brooklyn, New York. Includes looping switch, pitch control knob, 1/8" output jack for headphones, speakers, or recording gear. This is a fun little device that engages kids. I bought 5 for a traveling music program, and they were subjected to daily heavy use by kids of all ages, and also banged around in a travel trailer almost every day this summer. I think they stood up fairly well. The couple of things that gave out, after hundreds and hundreds of kids played with them, was the switch in one and the headphone jack in another. We just hot glued them back. So I'm pretty pleased, and would recommend them. The coolest gadget I've seen in a long time! I love the quality and simple beauty of this toy. Promotes initiative and creative thinking and allows for endless exploration. I purchased this for my wife for our 5th anniversary. At 5 years you are supposed to buy something wooden. I bought this to put our wedding song on it so she could play it. When it arrived it didn't work and I even changed the batteries. The return was better than any company I've ever dealt with. When the second arrived it wouldn't record an entire song, less than 4 minutes. No where on the site did it mention maximum recording length. The sound is ok. 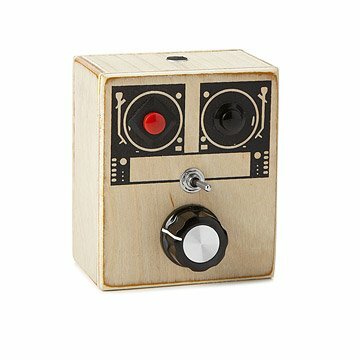 I bought this as a gift for my 8 year old grandson along with the Mason Jar amplifier. Once we really got the hang of it, the whole day was filled with creative sounds from the whole family being looped!! My son-in-law was letting his kid-ness out and having a lot of fun with it. It's truly a unique gift that's fun for the whole family! Thank you Unncommon Goods for offering this to us. Batteries not included. Directions very tiny on box and don't include how-to re batteries. Otherwise, 6-year old loves it.